Bob Woodward, a best-selling author and critic of President Donald Trump, said Tuesday night that CNN's lawsuit against the Trump administration wasn't the "remedy." 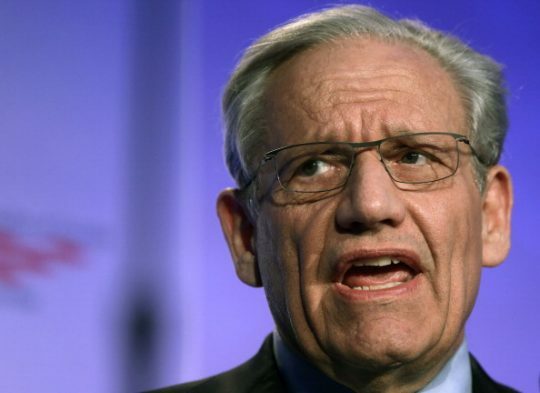 Woodward, who gained fame for breaking the Watergate scandal, spoke at the Global Financial Leadership Conference in Naples, Florida where he recommended "more serious reporting" about what Trump's actions, according to remarks flagged by the Washington Examiner. "In the news media there has been an emotional reaction to Trump," NBC News reporter Dylan Byers reported Woodward as saying. "Too many people for Trump or against Trump have become emotionally unhinged about this." BOB WOODWARD at Global Financial Leadership Conference in Naples, Fla., shortly after CNN sues White House over @Acosta :: "In the news media there has been an emotional reaction to Trump … too many people for Trump or against Trump have become emotionally unhinged about this." Acosta's White House "hard pass" was suspended last week following a heated interaction where he refused to give up the microphone to a White House intern after an aggressive series of questions. Trump repeatedly told him to sit down, but he didn't listen to him, which ultimately led him to be accused of manhandling the intern. CNN announced its lawsuit in a tweet on Tuesday, writing "This morning, CNN filed a lawsuit against @realDonaldTrump and top aides. The White House has violated CNN and @Acosta's First Amendment rights of freedom of the press and Fifth Amendment rights to due process." CNN also said that, "if left unchecked, the actions of the White House would create a dangerous chilling effect for any journalist who covers our elected officials." The White House called the complaint "just more grandstanding from CNN" and said the administration would "vigorously defend against this lawsuit." The press secretary said Acosta's inappropriate and unprofessional behavior could not be tolerated in the interest of running an "orderly and fair press conference." Woodward has previously criticized the modern media, calling them "smug" and "self-righteous." "In lots of reporting, particularly on television, commentary, there's kind of self-righteousness and smugness, and people kind of ridiculing the president," Woodward told CNN's Dana Bash in early 2018. "When we reported on Nixon, it was obviously a very different era, but we did not adopt a tone of ridicule. The tone was, ‘what are the facts?'" This entry was posted in Politics and tagged Bob Woodward, CNN, Donald Trump, Jim Acosta. Bookmark the permalink.